Fresh, local sweet corn is a special treat in Cincinnati. 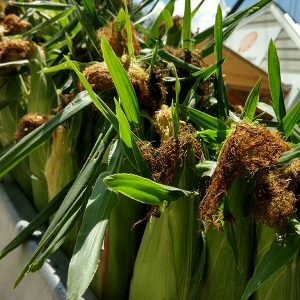 Sweet corn can be purchased fresh daily because it is picked every morning by our local farmers in Butler County, Ohio. One of the many misnomers regarding sweet corn is that it is a Genetically Modified Organism (GMO) product. The local sweet corn in Cincinnati is not a GMO product. Field corn, the majority of the corn seen along our highways for the feeding of livestock, may in fact be a GMO product.